Mix the flour, salt and yeast in a bowl. Add the milk and all the other ingredients up to and including the butter, knead to form a soft, smooth dough. Cover and leave to rise at room temperature for approx. 1½ hrs. until doubled in size. Shape the dough into a roll, cut into 12 pieces and shape into balls. Lightly flour the handle of a wooden spoon and make a hole in the centre of each. Allow the dough rings to form around the spoon handle until the opening measures approx. 4 cm in diameter. Place the bagels on a baking tray lined with baking paper, cover and leave to rise for approx. 15 mins. Bring the water and sodium bicarbonate to the boil, allow 3 bagels at a time to infuse for approx. 12 secs. in just-boiling water. Remove with a slotted spoon, drain thoroughly and return to the baking paper. Approx. 15 mins. in the centre of an oven preheated to 220°C. Remove the bagels from the oven, allow to cool on a rack, cut open. Puree the rocket with the oil, stir in the cream cheese and lemon juice, season with salt. Spread onto 8 bagel halves. Put the cucumber and pepper onto 4 bagel halves. 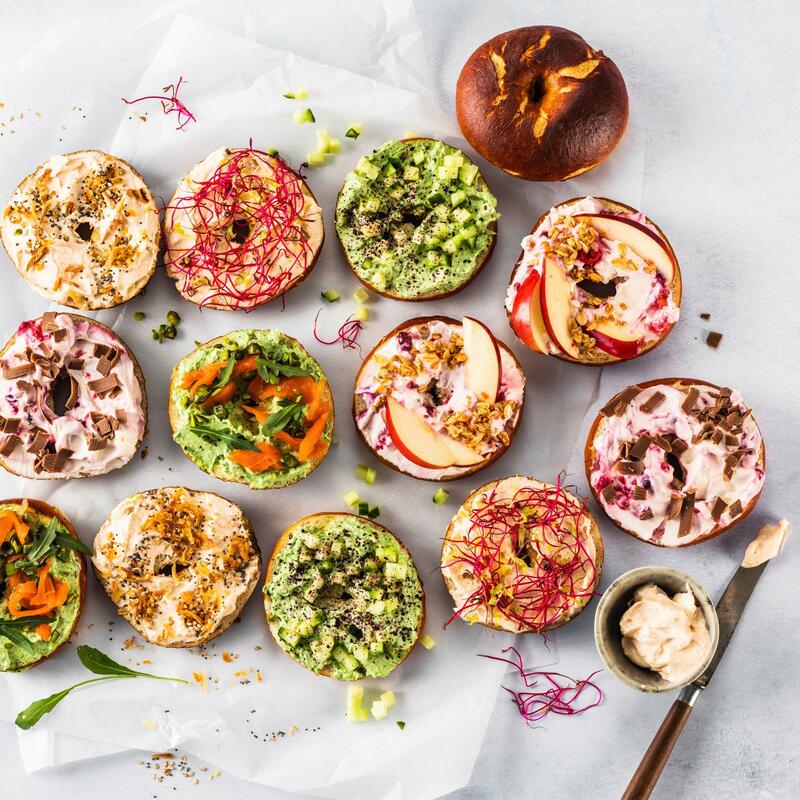 Place the salmon, pistachios and rocket on the other 4 bagel halves. Mix the cream cheese and paprika, season with salt. Spread onto 8 bagel halves. Put the beetroot shoots and lemon zest onto 4 bagel halves. Scatter the onions, poppy seeds and sesame seeds over the other 4 bagel halves. Combine the cream cheese, berries and icing sugar. Spread over 8 bagel halves. Put the apple and crispy muesli onto 4 bagel halves. Place the chocolate on the other 4 bagel halves.